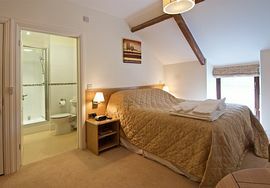 We are situated within a few minutes walk of the castle, church, pubs, clubs and food outlets. We offer a warm welcome with pot of tea or cafetiere of fresh coffee, home made cakes and biscuits. We offer a choice of cereals, fruit juice, yoghurts and choice of freshly cooked breakfasts. 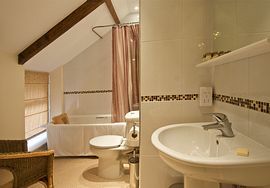 There are three double and one twin room (all with en suite shower rooms, one double with a bathroom) luxury beds and bedding. There are complimentary beverages and toiletries in each room. 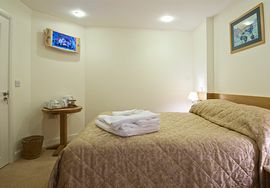 The rooms are separate from owners accommodation but we are on call if needed 24 hours per day. 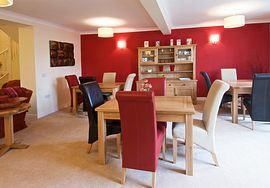 Comfortable lounge dining room, that can be used for your own food. Come and go as you like, with your own keys. 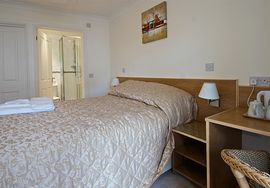 Double and Twin Rooms £35 per person per room for two people. Open all year except Christmas Eve, Christmas Day and Boxing Day. Special Diets Provision: Special diets are catered for. All dietary requirements can be catered for if requirements are outlined. Almost opposite the Murco petrol station look for the 'Cydweli B & B' signs, one of which will direct you down a right of way which leads to a secure car park at the rear of the house. If you are coming from Llanelli the car park turn is before you see the house. If you are using satellite navigation or instructions printed from a 'route-finder' service please don't let it direct you into Vicarage Lane, which is a little further down Causeway Street. Kidwelly has a station and we will pick you up from here if required.